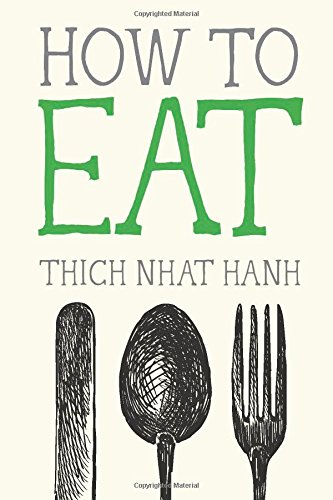 Through his Mindfulness Essentials Series collection of literal How To guides for modern day thinking, Thich Nhat Hanh shares some insights (and perhaps light) into eating and, How To Eat. This book covers the basics of mindfulness and how we can practice mindfulness at the kitchen table, truly considering (and appreciating) our foods for their actual worth and/or value to us as human beings so that we can better enjoy our meals while also reaping the (healing and nurturing) benefits that each food specifically provides for us. From the origin of the food, to how it got to the grocery for us to buy and then how the food was prepared prior to eating, How To Eat spells out the instructions about eating in a more mindful manner. Super easy and insightful read, perfect for anyone looking to eat (and digest) properly. How to Eat is part of the Mindfulness Essentials Series by Zen Master Thich Nhat Hanh, illuminating the basics of mindfulness practice. These short meditations cover everything from eating with others and enjoying our food to connecting with the Earth. Nhat Hanh inspires a joyful and sustainable relationship with all aspects of eating, including gardening, food shopping, preparing, serving, and even cleaning up after a meal. How to Eat is a welcome reminder that the benefits of mindful eating are both personal and global.